Even in Las Vegas, there comes a time to rest. The Plaza offers more than 1,000 comfortable and affordable rooms and suites, so it's easy to find a room that matches your mood and budget. We also offer a variety of gracious amenities to help make your stay as convenient and enjoyable as possible. 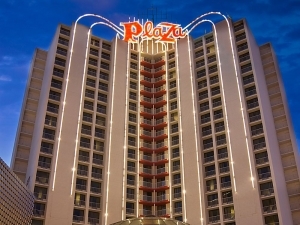 The Plaza Hotel & Casino offers standard and deluxe rooms, as well as petite, one- and two-bedroom suites. If you have special needs, just let us know. We also offer rooms and services for the disabled, including the hearing impaired. No matter what room you choose, you'll get a good night's sleep or, for our night owls, a good day's sleep. The Plaza boasts an 80,000 square foot casino with a rapid rotation of the latest, most innovative slots and video machines on the main casino floor. Table games include a large live Poker Room, Pai Gow Poker, Mini-Baccarat, Let it Ride and a bustling Keno Lounge and Sports Book. A 400 seat Bingo Center is also located on the second floor. Join the "free" Plaza Play Club and you'll become eligible for invitations to special events, tournaments and complimentary rooms and food. Throughout the year, The Plaza Hotel & Casino offers numerous slot, poker and bingo tournaments. The new and improved loyalty program enhances the enjoyment of your gaming experience. So join the Plaza Play Club to get your exclusively invitations to special events and tournaments, plus complimentary rooms and food. Membership is free. All your favorite machines are awaiting you at the Plaza. Come feel the excitement build as you shoot for a giant jackpot. As you can see, we have a little something for everyone. Not only do we offer great variety, but the Plaza is the friendliest, most comfortable setting in which to spend your time. Our friendly dealers and gracious staff complete a great Las Vegas experience. Conveniently located near valet and self parking, our famous Poker Room is popular with tourist and locals alike. The Plaza Poker Room is one of the last places anywhere to offer pan. The room has 3 pan tables and 15 poker tables spreading all of your favorite games. Come on in and join one of our daily tournaments! The Plaza has one of the largest Bingo rooms in all of Las Vegas. Our warm staff and friendly atmosphere make the experience pleasant and fun. Place a bet on all your favorite sports. Baseball, football, basketball or golf, whatever your game, we're here to put some excitement into your sporting event enjoyment. Take a refreshing dip in the swimming pool on the Plaza's rooftop. Then lounge and enjoy the sweeping views of Downtown Las Vegas and Fremont Street. A night out in Las Vegas requires a show of flash, fashion and style. So stop by the Beauty Salon at the Plaza to take advantage of their myriad services designed to help you look fabulous your big night out. Feeling a little guilty after that great dinner last night? Our fitness center will help you work off a little of that late night indulgence. The Plaza Hotel & Casino offers online services via an Internet Kiosk next to Seattle's Best Coffee in the lobby so you can conveniently access your email while on the road. The Plaza Hotel & Casino offers Valet Parking and Self Parking for both hotel guests and casino visitors. For transportation to the Las Vegas Airport (LAS), take the shuttle bus service that runs to the airport from the Plaza. If you'd like to travel in style, please contact the main desk or room reservations to inquire about Limousine Services. From the quick and easy to the luxurious and romantic, the Plaza offers a variety of dining experiences that you're sure to enjoy. Our world-class staff is dedicated to providing you the finest cuisine and excellent service. The Plaza Hotel & Casino provides entertainment and events that create a buzz throughout Las Vegas. Every month, we bring renowned entertainers to the heart of Downtown. So come join Plaza Hotel & Casino for the most unique and exciting entertainment in Las Vegas. The Plaza is bringing a hot new show to Downtown Las Vegas. Campy and cool, "Shag With A Twist" is a retro-style musical production set in the swinging 1960s. The show serves up an evocative cocktail of music, dance and color that brings to life a era when big hair, Tupperware parties and pupu platters were at the height of fashion. World class entertainment has always been a highlight of Downtown Las Vegas. The Plaza maintains that tradition by showcasing innovative and talented acts from around the world. The Plaza Hotel & Casino strives to present the finest musicians and entertainers year round. The popular Omaha Lounge features a variety of entertaining musical performances-and there's no cover charge! Serving classic American gourmet fare, the amazing Center Stage restaurant offers classic decadence in a glass-domed dining room overlooking the new Fremont Street Experience. Live performances are also featured Thursday through Monday in the Center Stage Lounge.